This summer we are having fun with our garden, keeping it simple and having a deliciously fun plan for harvesting. We are growing a pizza garden. What’s in our pizza garden? Patio tomato plants, oregano, parsley and sweet basil. We had intended to also grow garlic and bell peppers but the rainy spring was not our friend, so this year the pizza garden has been simplified. Regardless, there are still so many lessons for the kids; the growing process, responsibility in watering, harvesting and cooking. I was hoping for a little excitement from my youngest in this project and the concept of a pizza garden appears to be working. She has laid her claim announcing that she is the only one to pull ripe tomatoes from the vine and watering isn’t considered a chore, but it’s early in the process :)! Our plan is to make pizza sauce together with our spices and tomatoes and to also create a white pizza with some of the tomatoes and our sweet basil. Adding a little kid creativity to the project, we found chalkboard planter markers for only a dollar a piece. We then grabbed some inexpensive crafting paint from our craft shelves and my daughter created her own designs to add her personal touch to them for our pizza garden. She then decided which marker belonged to each plant, I added the names with a white puffy paint and now she is very proud of her creations and even more excited about our mini gardening project. What a great idea! I’ll have to remember this for next year, my kids will love it! this is such a cool idea! Thank you for sharing at Well Crafted Wednesdays! What a fun idea to have a pizza garden! My mom grows basil & I’ve been meaning to try it – maybe even indoors since I live in MN & I don’t think it’d do so well outside in December Anyway, thanks for sharing – I saw you at 52 Mantels! I love this idea for getting kids into gardening and finishing a task with style because we can’t always fill the pantry with our garden! This is a great end goal. What a great way to get kids interested in gardening! Definitely stealing this idea once Molly is old enough to participate! Growing a themed pizza garden is a great idea. Kids as well as adults would love it! Thanks for sharing with SYC. Such a cute idea! I love that your garden has a purpose and the super cute markers! 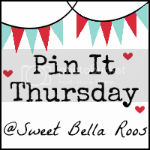 Thanks for sharing at Pin It Thursday.